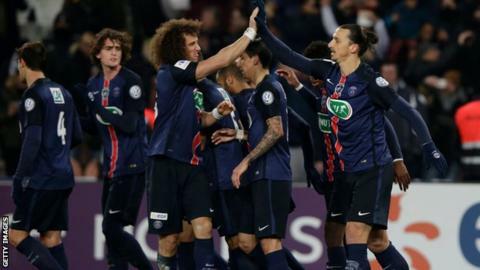 Zlatan Ibrahimovic scored an 89th-minute winning penalty as defending champions Paris St-Germain came from behind to beat Toulouse and reach the last 16 of the French Cup. The Sweden striker scored a late winner in Saturday's 1-0 league win at Toulouse and struck again in Paris. Toulouse took the lead through Francois Moubandje before David Luiz levelled. PSG, unbeaten in domestic football all season, lead Ligue 1 by 21 points and are going for a consecutive quadruple. Last year Laurent Blanc's side won the French League Cup, the French Cup, the league title and the Trophee des Champions - France's equivalent of the Community Shield.